YACHATS, Ore. – On a clear day, the view from the Cape Perpetua Scenic Area in the Siuslaw National Forest stretches 35 miles north and south along the Pacific coast. Being 800 feet above the surf makes that long-range view possible. Cape Perpetua is the highest viewpoint accessible by car along the Oregon coast. Down below is Highway 101. 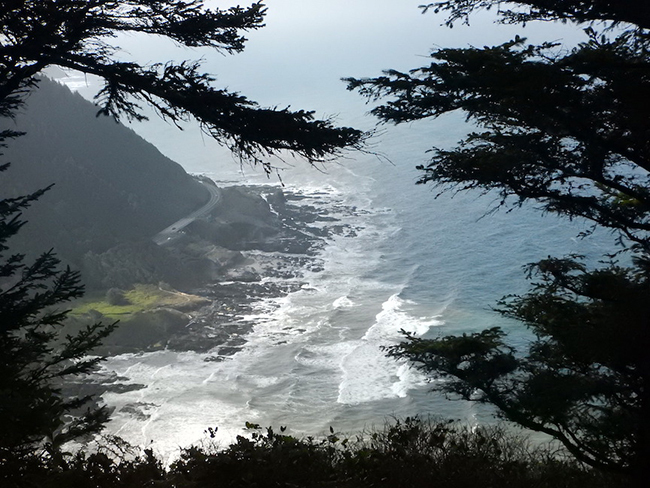 View from the Cape Perpetua Scenic Area in the Siuslaw National Forest - Image by Tom Adkinson. In addition to spectacular coastal views, Cape Perpetua Scenic Area offers 26 miles of Civilian Conservation Corps trails into the forested interior, some of which is old-growth forest. A trail along Cape Creek leads to a towering Sitka spruce tree that sprouted about 550 years ago – long before Christopher Columbus began poking around on the other side of North America. That spruce is 185 feet tall and 40 feet in circumference. Images by Tom Adkinson and Doug Hobart.